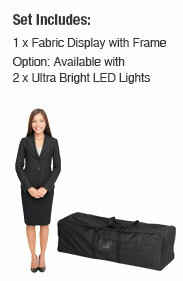 Bringing the display to events is easy using included carrying bag that holds all components! Also available in 2.3m x 3m and 2.3m x 6.1m sizes! 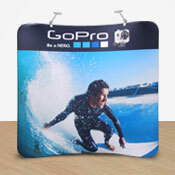 The portable trade show stands, exhibition display systems are a unique curved pop up that feature an aluminium frame that needs no tools for an assembly that takes under 5 minutes! The lightweight display collapses down small as well, fitting inside the included carrying bag that makes bringing the pop up graphic kit to and from events easy. This bag is also helpful in keeping the stand from gathering grime or dust in between use to maintain a professional appearance. These exhibition display systems use your custom graphics digitally, printed using dye-sublimation, to show your designs in vivid full colour and help draw the attention of passersby. 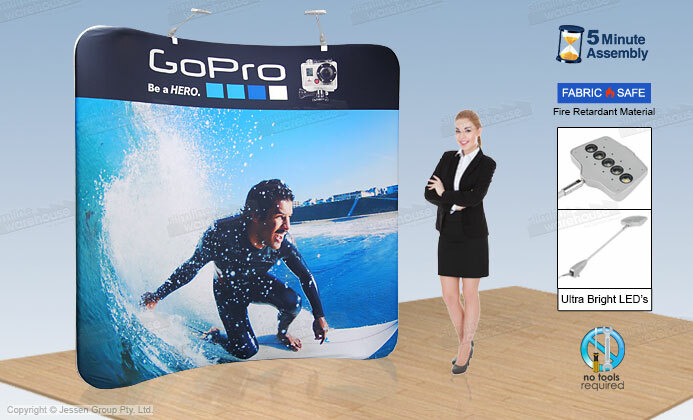 These expo booth backdrops use machine washable polyester fabric that is also flame retardant for an added safety measure. Order today with the optional LED lights to receive (2) lamps that attach to the top of the stand to highlight your graphics and help get your company name recognised by potential customers at trade shows, shopping centres, retail stores, exhibitions, expos, and other events! Click here to see the massive online catalogue, full of hundreds of different products in a variety of categories that can be used to outfit your business in style without breaking the budget. For over 20 years, Slimline Warehouse has been providing Australians with top-notch products at affordable prices. 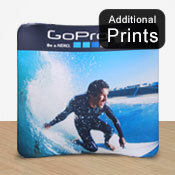 Same day despatch is offered with most in stock items that have been purchased prior to 1pm EST out of our warehouse. Order for your business today anywhere in Australia, including Sydney, Perth, Canberra, Melbourne, Adelaide, Brisbane, Gold Coast, Bendigo, Cairns, & Hobart!